A lite version is available free, with a loading delay to access glossary definitions. Index information is stored on your phone. Fast access and no network connectivity required. Each page has been cross referenced for fast browsing of glossary terms. 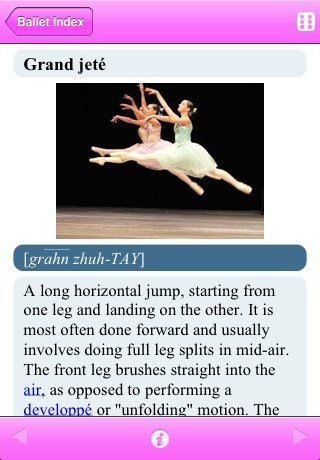 Random flashcard functionality allows you to test your knowledge of Ballet terms (In version 1.1). Ballet Index uses some of the information available on the Wikipedia Ballet page. This data has been modified, optimized and cross referenced for the iPhone.